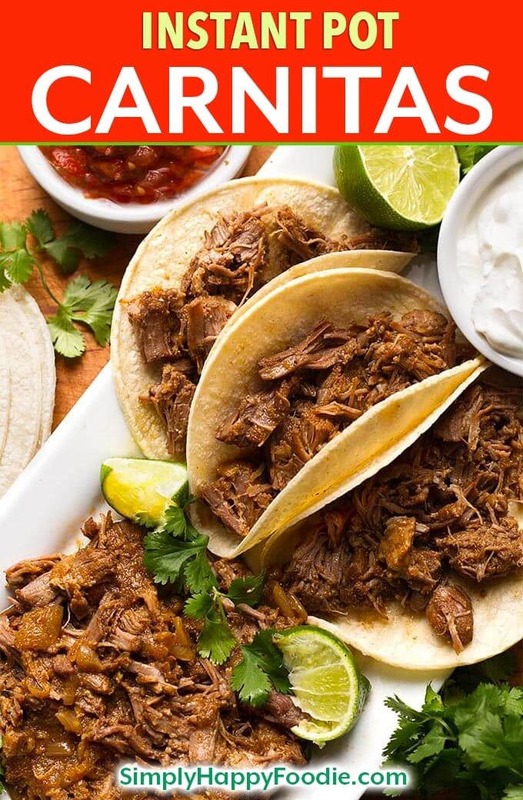 Instant Pot Pork Carnitas are tender and very flavorful meat made in your electric pressure cooker. 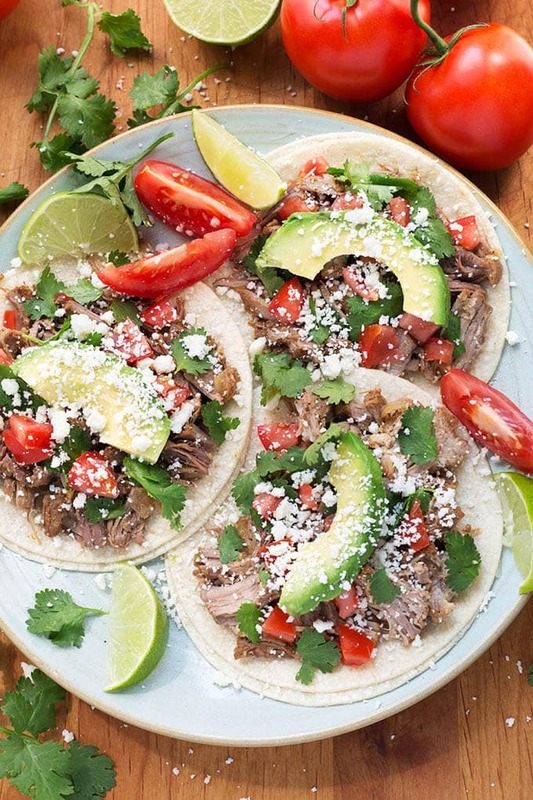 Amazingly, you can have these pressure cooker carnitas in about an hour! Today was a scorcher in the Pacific Northwest! When I say that I mean the temperature outside is 86 degrees! My sister lives in Arizona, and right now she probably wishes it was only 86! They are enjoying 100 degrees with a side of thunder and lightening! No thanks! This girl right here is used to an average temp of 60. We don’t have air conditioning as it didn’t seem worth it to pay for one that we’d use maybe 2 weeks out of the year. But right now I kinda wish we had one! Oh well. It beats the rain! I like to cook no matter what the weather is doing, so on to the Carnitas! Because of the heat, there was no way I was using my oven today. Thank goodness for my Instant Pot! I just love it! Electric pressure cookers are so popular, and it has a lot to do with the fact that you are less likely to blow the lid off of one of these. They have a lot of fail safes built in. The best part about using it to make my Instant Pot Pork Carnitas is that I don’t have to use the oven and make my kitchen hotter. 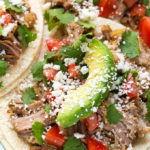 That and these amazing Carnitas are done, tender and flavorful, in just under an hour! Watch the video showing how I make Instant Pot Pork Carnitas. 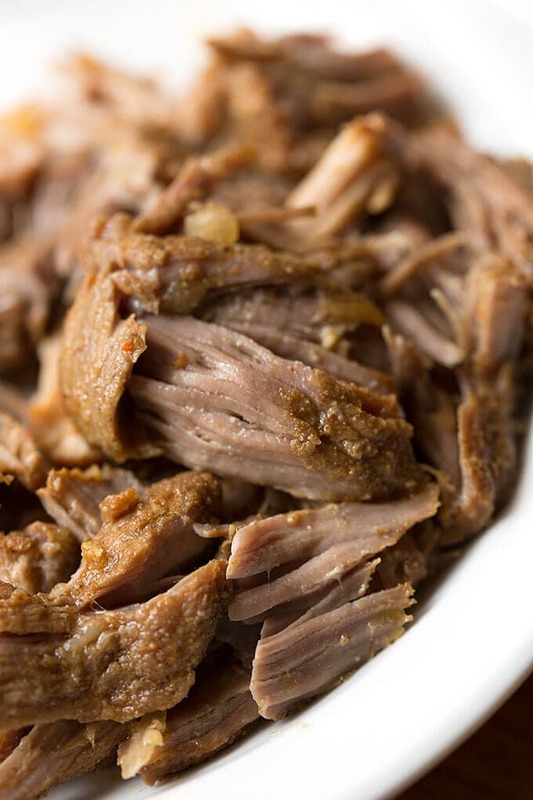 Instant Pot Pork Carnitas are incredibly delicious and easy to make. Ready in under an hour! In a mixing bowl add the olive oil and spices. Mix well. Add the pork chunks and stir them to make sure they are completely coated with the oil/spice mixture. Set aside. Chop the onion into a 1/2 inch dice or so. Pour the orange juice into the Instant Pot inner liner. Add the pork chunks and the chopped onion to the pot and stir just to combine. Place the lid on the IP and set knob to the Sealing position. Press the Pressure Cook (or Manual button) or dial, and use the +/- buttons to adjust the time to 35 minutes. Make sure it is set to High Pressure. After cooking cycle ends, let it sit and naturally release pressure for 15 minutes. Then Manually release the remaining pressure. When the pin on the lid drops, and it is safe to open the lid, open it facing away from you, to be safe. Not the kind of facial you want! Remove meat to a plate or bowl and shred, using two forks. Don’t shred too much as you want to have some slightly bigger pieces. Very carefully strain the liquid in the pot, (saving the onions, and discarding the cinnamon stick) into a fat separator. Pour as much of the degreased liquid as you want into a large serving bowl with the pork and the onions, and mix well. Serve warm on your favorite tortillas, on a bun, over a salad, over corn bread. Garnish with whatever you like. Cilantro, avocado, tomatoes, green onion, salsa, Cotija cheese, sour cream, lime juice. These Carnitas are amazing! The best I’ve ever had. We don’t bother going to Mexican restaurants the Carnitas anymore. They all pale in comparison. After I shred them I put them on a baking sheet and throw them underneath the boiler for a while to give them a little crispiness. Oh my gosh, so yummy. That’s great, Eva! Thank you for your review! Love some carnitas! Thank you for sharing this recipe. These Carnitas are amazing! The best I’ve ever had. We don’t bother going to Mexican restaurants the Carnitas anymore. They all pale in comparison. After I shred them I put them on a baking sheet and throw them underneath the boiler for a while to give them a little crispiness. Oh my gosh, so yummy. Hi Eva! Thank you for the great feedback, and for taking the time to review this carnitas recipe! I’m so happy that you enjoy it!